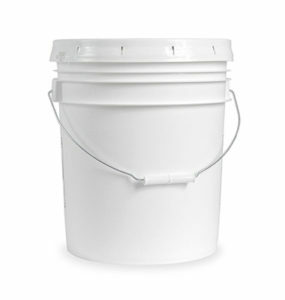 Food Grade plastic buckets, believe it or not, can often be found at your local big-box hardware or home supply store. A food grade 5 gallon bucket with lid should cost about $6-8 total. The 5-gallon size is very common, although 2-gallon buckets are often available in food grade as well. These containers will be clearly marked “Food Grade” or “Safe For Use With Food”. Homebrew shops are another place to find food grade buckets locally, where they are sold as “fermentation buckets” for brewing beer. Here you should be able to buy in a few different sizes, including 6.5-gallon, 7-gallon, and even 7.9-gallon capacities. Wherever you purchase, if you need buckets or containers that will come into contact with food, make sure the containers you are purchasing are made of food grade plastic. Food Grade plastic buckets can be purchased online in a wide variety of shapes and sizes. Buying online is often better if you are buying in bulk, or need a specific type that you aren’t able to source locally – such as square buckets, different colors, or harder to find sizes (such as 3.5-gallon, half-gallon, 1.25-gallon). 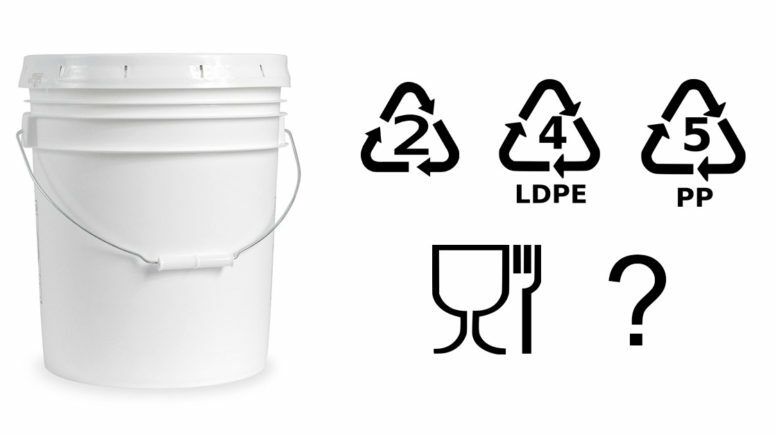 Standard 5-gallon bucket, made from Food Grade High-Density Polyethylene (HDPE) Plastic. Food grade plastic is plastic that can be safely used to store food items with minimal risk of the plastic leaching into the container. It differs from other types of plastic also because the way it has been manufactured, making it safer to use in products where there is contact with food. Plastic containers are marked with the number 1 through 7 to designate the different types. It’s important to note these numbers because some are not good for use as food containers. Here are the most common types that are sold as food grade. Food grade plastic containers are often made of high-density polyethylene or HDPE, which is classified as Plastic #2. This type of plastic is very resistant to chemicals and food products and won’t wear down when exposed to corrosive items. HDPE has a 230 degree Fahrenheit temperature limit and is commonly used in five gallon buckets. Low-density polyethylene (LDPE), classified as Plastic #4, has a 176 degree Fahrenheit limit and is often food grade as well. You’ll commonly find LDPE used in food grade plastic bags. Last, but not least, is polypropylene (classified as Plastic #5). This material has the highest temperature limit (275 degrees Fahrenheit), making it appropriate for hot foods and microwaveable containers. It is usually food grade and can be found serving this purpose in both single-use and reusable food containers. From left: HDPE “2” symbol, LDPE “4” symbol, PP “5” symbol, “Wine Glass and Fork” symbol (signifying food safe material, often used in combination with resin identification codes). Why Are Plastics Sometimes Not Considered Food Grade? Some plastics can degrade over time and release small amounts of chemicals. These can be dangerous if the chemicals end up in food. So some plastics (even if one of the types listed above) may not qualify for use with food due to how they’re manufactured. Slight manufacturing differences can alter the way certain types of plastics end up when finished. Something as similar as a small cut on the side of a container could degrade its food grade status, though more common problems include a lack of finishing or a broken seal. Manufacturing defects/variations that make plastic non-food-grade cause leaching that could be dangerous to the food. For this reason, it’s important to not assume that a bucket or container is food-safe just because it’s made of a material like HDPE – always look for the “Food Grade” designation when purchasing. Be the first to comment on "Food Grade Plastic Buckets"